Pimilco Laminate Collection: With its chic and stylized design, the Pimlico Mocha (7020) or Walnut (7027) laminate collection features a deep rich finishes with Satin Aluminum hardware as well as Satin Aluminum framed bases, frosted-glass modesty panels, and frosted-glass Overhead Storage doors. A floating-top look is achieved by a contrasting Satin Aluminum recess and recessed-angle top edges. Basic pieces are offered in either an economical, flat-pack shipping carton. Tops are 1.25 inches thick with Thermally Fused Laminate (TFL) surfaces. The edges have a slight recessed angle for design appeal. Edges are PVC and are colored to match the surfaces. Tops are separated from the chassis with a satin aluminum finished reveal that enhances the design and appeal of the product. Substrate is wood and wood material. Construction Chassis is wood and wood products with a TFL surface and aluminum finished framed frosted glass modesty panels. It features Camlock construction with screws and cleats for reinforcement and stability. Drawers feature a 4-sided melamine on MDF construction with pinned and glued joints. All drawers are suspended on metal, ball-bearing slides. Satin nickel drawer pulls compliment the other exposed metal of the items in the series. Pimlico Laminate Collection offers built in wire management channel and 3"-round grommets on each surface section. The ACT AirCharge is the newest edition to our Tabletop family of power and data units. It has 1.5 AMP, 5V Input. The ACT AirCharge is the newest edition to our Tabletop family of power and data units. It has 1.5 AMP, 5V Input. High-contrast materials in a contemporary design. The smooth Mocha finished wood grain laminate constructed Pimlico round conference table provides durability and appeal. The sleek and stylized design is enhanced by satin aluminum finished base and top reveals. Pimilco Laminate Collection: With its chic and stylized design, the Pimlico Mocha (7020) or Walnut (7027) laminate collection features a deep rich finishes with Satin Aluminum hardware as well as Satin Aluminum framed bases, frosted-glass modesty panels, and frosted-glass Overhead Storage doors. These tables can be expanded with 4' or 5' sections. Pimilco Laminate Collection: With its chic and stylized design, the Pimlico Mocha (7020) or Walnut (7027) laminate collection features a deep rich finishes with Satin Aluminum hardware as well as Satin Aluminum framed bases, frosted-glass modesty panels, and frosted-glass Overhead Storage doors. These tables can be expanded with 4' or 5' sections. Pimilco Laminate Collection: With its chic and stylized design, the Pimlico Mocha (7020) or Walnut (7027) laminate collection features a deep rich finishes with Satin Aluminum hardware as well as Satin Aluminum framed bases. 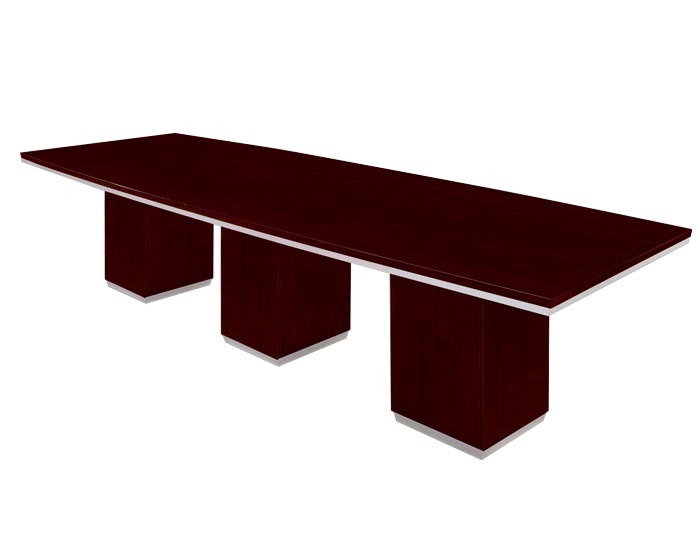 Thses conference tables can be expanded with matching 4' or 5' sections.